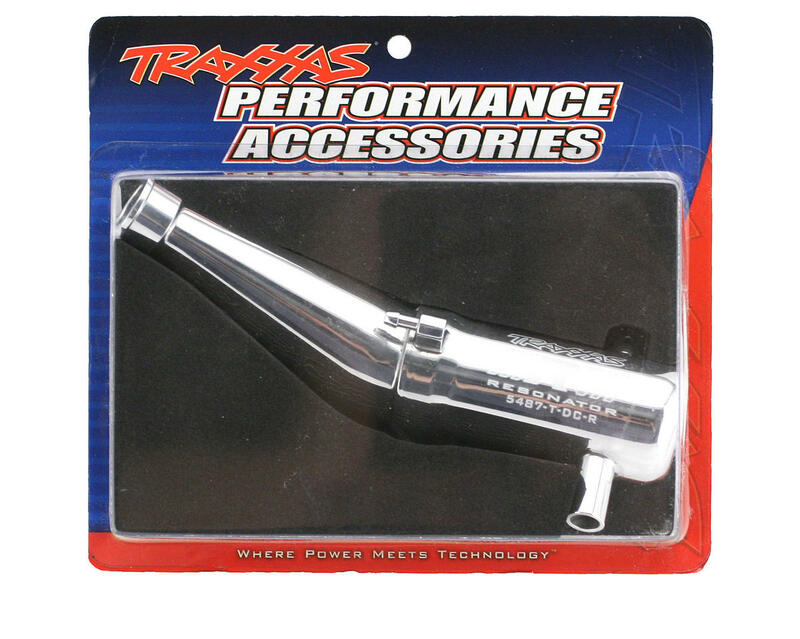 This is an optional Traxxas Resonator Tuned Pipe. 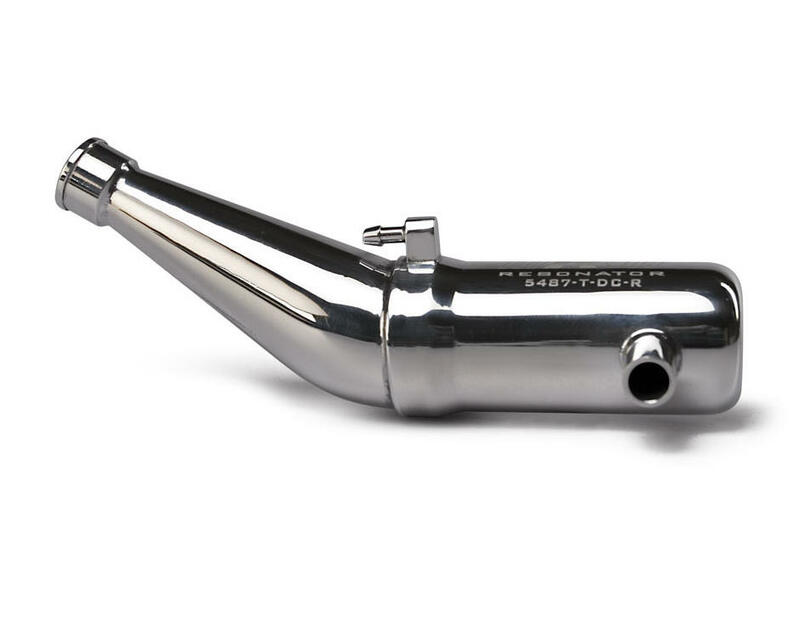 The Traxxas Resonator aluminum tuned pipe for Maxx trucks is specifically engineered to boost performance. It is the ultimate Maxx musclepipe! Traxxas Resonator aluminum tuned pipes are precision-engineered on the dyno to increase the power output of TRX® Racing Engines. This Resonator dual-chamber Maxx pipe provides an average peak torque increase of 16% resulting in brutal bottom end punch. A 10% increase in total power across the whole range provides smooth power delivery, perfect for the back yard or the race track. All Resonator pipes are fully polished to a beautiful mirror-chrome finish with a laser etched logo. Mounting hardware is included. Bought this in late summer of 2017 and a new TRX 3.3 engine in my T-Maxx Classic and OMG!!! This combo with VP Power Master Master Basher 20% Nitro is a WINNER!! I am more than extremely impressed with the power, and reliability over a TRX 2.5 engine with 20% Top fuel on a stock plastic pipe (350F and with the body off, tuning is unpredictable, engine sometimes dies at idle for no reason and idle is erratic... the 2/5 is plenty tight, no hurt sleeve or piston, bearings never leak ever, always performed after run maintenance and rebuilt and cleaned the carb.. same problem)... back to the pipe and 3.3 engine.. simply put.. BUY IT!! You will NOT regret it as the 3.3 is much better suited to a T-Maxx (I cannot imagine what an O.S .21TM would be like... my guess is that it would be like heaven and this 3.3 is no slouch and a lot better than ANY 2.5 engine (Silver stock cast head stay away from it!!))... wheelies on demand, even when rolling at 10mph and stab the throttle she is wheels up! temps with my 3.3, resonator top end tuned pipe, and 20% master basher blend is hitting roughly 240-260F with the body on and it performs amazingly well... more driving and less tuning... run times are around 15-20 minutes per tank (smiles grand!!)... hope my stock plastic axles hold up (anyone know where you can still buy or who makes steel cvd upgrade kits for the T-Maxx2.5/Classic still? front/rear and or center but mostly i need a pair for the rear... if you, do email me! ajcgeminitwin@gmail.com)... Traxxas fuel i admit is only good for cleaning... 33% top fuel is AWESOME for carb cleaning... high nitro fuels make great cleaner (higher the better... use 20% minimum)... My only regret is that i did not get the resonator and 3.3 engine sooner! BUY ME! !